Hi loves! Today I have my first Mundo de Uñas experience to share with you. 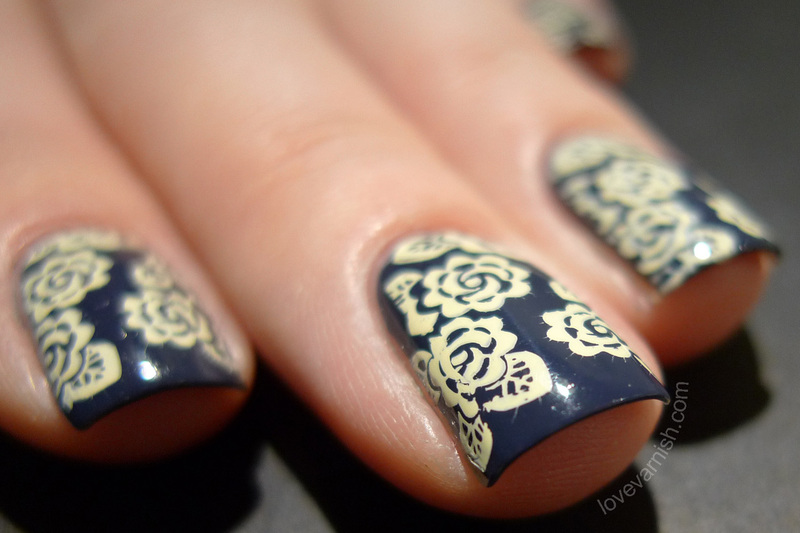 If you are into stamping then you might have heard about these crazy pigmented stamping polishes. They are cheap, come in a wide range of colors and they truly show up on dark bases. When I saw this gorgeous manicure Marta did with them I couldn't resist and ordered 9 mini's. When they arrived, I was surprised to see that my Blue Grey #35 got upgraded to a full size bottle. Nice surprise! The mini bottles are 5 ml. and the full size hold 14 ml. The reason I got minis is because I wanted to try some different colors and you can find more for the same shipping cost ;-). My first manicure was using Mundo de Uñas Papyrus #43. I'll admit this doesn't really look like the color it should be according to the site.. it looks more like a supersoft cotton candy pink cream hue? Mine is more of a yellow tinged cream. Not a bad shade at all, just not what I anticpated. I also ordered Cream #12 and it looks like a light yellow shade. The other shades look a lot more like the site pictures. The formula on these is thick, and they have a paint like smell. Because I ordered mini bottles I might need to add my own stainless steel balls to keep them mixed as I've read they separate quite quickly. The pigmentation..? AWESOME! Really, super opaque and that with a light shade over a dark base. I was really blown away by it! Working with these took some getting used to. Because they are SO pigmented and thick, you have to scrape at a different angle - more 90 degrees rather than 45. Or slightly angled but not as much as you'd usually do. Also, when working with a squishy stamper (as I do) means you have to use less pressure when picking up and transferring the stamp. I smudged my image a few times before I realized that and ended up redoing a few because of it. 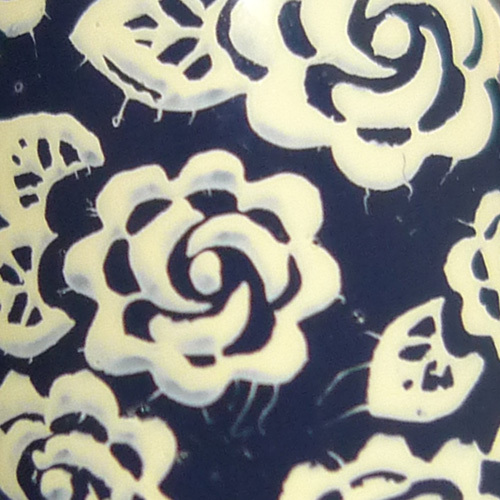 Now in my pictures you see a lot of little "hairs" on the edge of the stamping images, these are not visible in reality. It's just something you see up close. 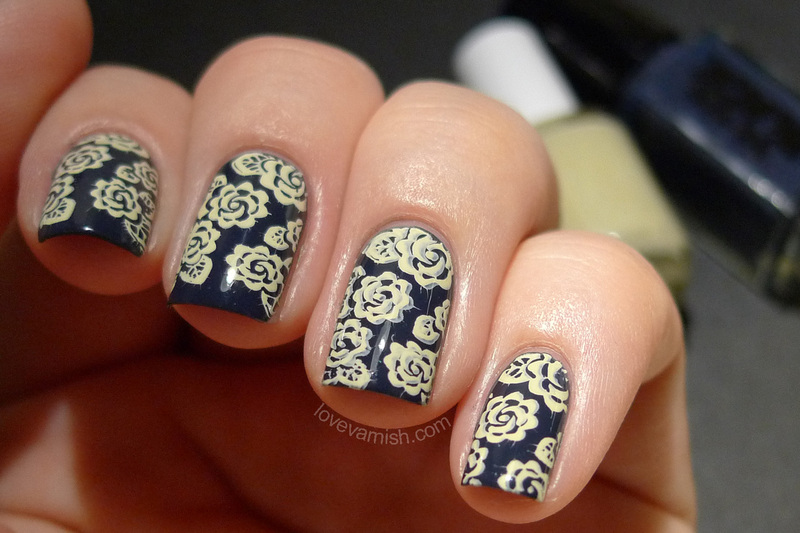 I really liked how the stamping shade showed up over this dark blue base (a shade from the The New Black Seine set) and the vintage feel it creates using this rose pattern from Emily de Molly EDM05. Have you tried Mundo de Uñas stamping polishes? If so, do you have any other tips or tricks for using these? Tell me in the comments! You can order Mundo de Uñas stamping shades on their own website. Mini's cost $1,65 and hold 5 ml. while full size bottles are 14 ml. and cost you $3,50. Currently there are 56 shades available. Emily de Molly image plates are available here and cost $6,50 - the quality is amazing and you totally need some ^^! Hopefully using some steel balls will help mix them back properly! What other colors do you recommend :-)? :-D buy them, they are wonderful ^^. I can really recommend them! And the shipping isn't even too bad either. Ooooh didn't even know they have sets as well! Might order a set next time around :-). Thanks Lou!